Maria Sharapova had a wild 2013 that ended prematurely with a right shoulder injury. Maria emerged victorious twice this year, earning titles at Indian Wells and in Stuggart. The 2012 Roland Garros champion was unable to defend her major title, reaching the finals of the clay court championship where she was defeated by Serena Williams. 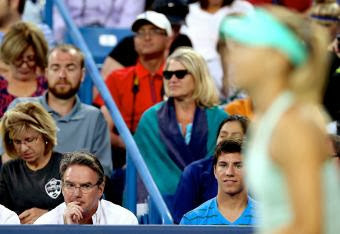 After the loss, Maria played three more times in 2013 making brief appearances at Wimbledon, where she skidded on the grass uncontrollably for two rounds, and then in Cincinnati for one losing match. Along the way, Maria cycled through two coaches, ditching Thomas Hogstedt in June 2013. Maria surprised the tennis world by signing Jimmy Connors to her camp later in the summer only to dismiss a few weeks later shortly before the US Open. Ms. Sugarpova Sharapova continued to make bank on her candy line and ramped up press by tantalizing with the notion that she would seek an official name change - playing as Maria Sugarpova - during the US Open. Alas, this was just a well-timed rumor which generated oodles of free press. Maria ended up withdrawing from the US Open an the WTA Championships in Istanbul. She closed out her 2013 campaign in August with an opening round loss to Sloane Stephens in Cincinnati. Reached SF at Australian Open (l. to Li). Reached SF at Doha (l. to S.Williams). Runner-up at Miami (l. to S.Williams in final). Won 29th WTA title at Stuttgart (d. Li in final). Runner-up at Roland Garros (l. to S.Williams in final). Reached 2r at Wimbledon (l. to Larcher de Brito). Dropped opener at Cincinnati (after 1r bye, l. to Stephens in 2r).